Ah, the beautiful San Blas islands. the stuff dreams are made of, white sand beaches, palm trees, rustic cabins by the sea, this is where you come to get away from it all. 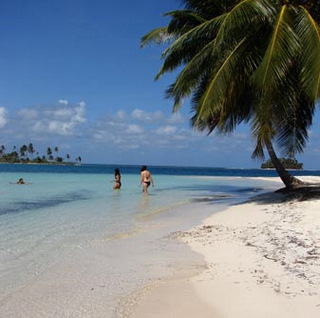 Can you imagine a few days at San Blas? 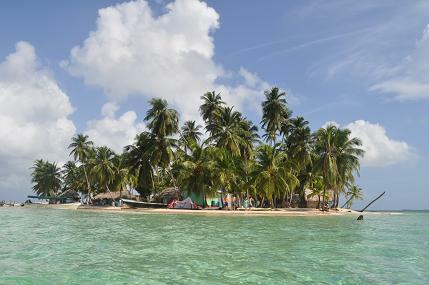 We can, and we can organise tours in the San Blas islands for you. 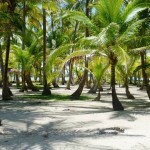 Well, it`s not a tour of San Blas as such, but we`ll explain……. 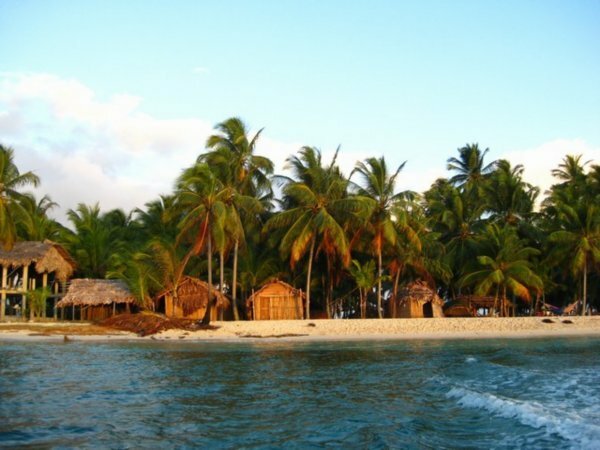 The San Blas islands, or Kuna Yala, comprise of 365(one for everyday of the year they say) islands located along the Caribbean coats of Panama. Granted semi independence in 1925, the Kuna Yala is run by an elected Congresso. Some 40 islands are inhabited and run by a chief who is a representative to the Congresso. The Kunas have managed to fiercely retain their culture for over 500 years, despite repression by first the colonial Spanish and then Panamanian governments. Life in the islands is still very traditional, many live as their families have done for generations. 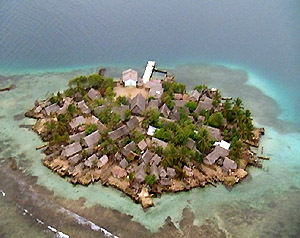 The Kunas guard their San Blas islands by only allowing Kunas to own property within their areas. Foreign, or Panamanian , owned businesses are not allowed. Only some communities have running water and cooking is still often done over open fires. Most people still sleep in hammocks in communal areas inside their huts. The women still wear brightly coloured clothing, wide skirts and multi-coloured beaded bracelets wrapped the whole length of their lower legs and arms. It`s not uncommon to see Kuna women dressed like this in all parts of Panama. Here at Mamallena we bring it all together for you. 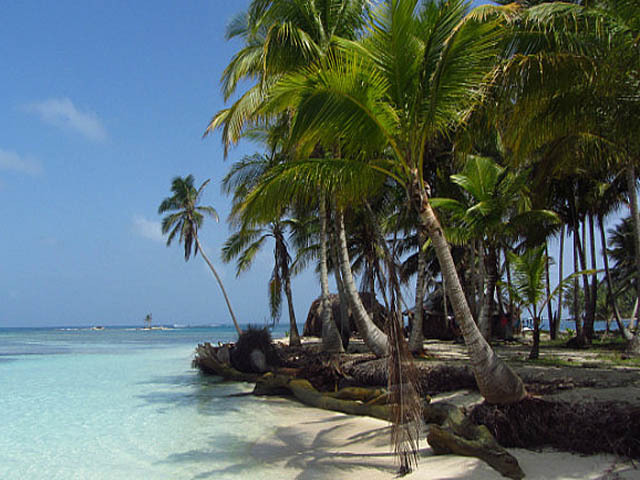 We don`t organise a tour to San Blas but we bring together the components of the trip. 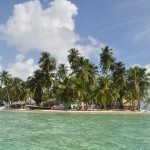 We provide objective information about San Blas and about what accomodation options you have in the islands. You make a decision about where you`d like to stay and we make the booking for you. We then arrange transport to Carti(the only part of San Blas with road access) in a 4x4. We don`t have a profit margin added on top as do many tour providors. 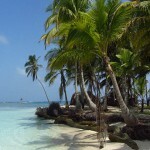 We`ve seen people offering some of the exact same trips as we offer for $100 more for a 3 night stay in San Blas. Why pay more than you have to? Transport leaves to San Blas daily from the hostel at 5.30am and costs $30 each way in a 4x4. There can be later departures if theres enough demand but it’s best to get there early, meet the people from your accommodation and get to the beaches! 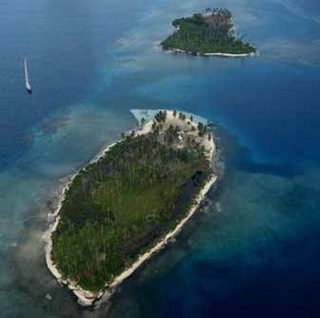 Contrary to what you may have heard, it’s not dangerous, nor is there a problem to drive to San Blas. The road has been paved and it’s like driving on a main highway(nearly). Driving time is around 2.5 hours but has been known to take 10 hours (when the weather was bad and the road worse than it is now). There are also Kuna taxes to pay, $10 to enter the area and $2 at the port where you get dropped off. It can get confusing at the drop off point, due to local disorganisation. The driver will try and sort out the people you`re staying with but you may have to wait for them to arrive. Don`t worry, they`ll find you!! 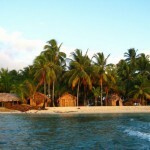 WHERE TO STAY IN SAN BLAS, THE FACT SHEET. 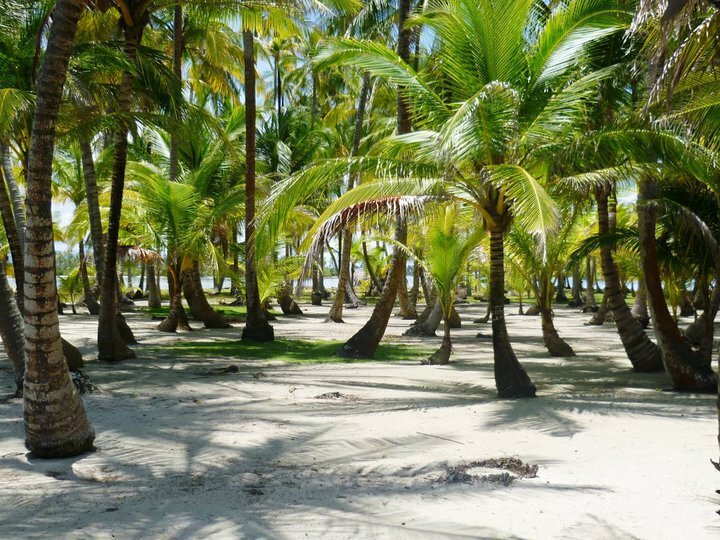 We don`t claim to know everything about San Blas, but we do have good, reliable contacts in the Carti-El Porvenir-Rio Sidra area. Accomodation prices range from $22 a day(including food) to $100 a day per person. The thing is, a more expensive place doesn`t always ensure you of a much higher standard. Just remember that not all these places are for everyone, thats why we give you as much information as possible to allow you to make your own decisions. Franklin’s: Well known over the last few years, Franklins has become one of the places we send people to the most and rarely get complaints. They have a number of cabins and a beach on their half off the island. The island is small but split into 2, although it is hard to distinguish any divide and it seems to be no problem to wander around the islands fringes in the shallow surf. They charge $26.00 per person per night for dorms with 3-5 sharing or $55 for private rooms for two, this includes three simple meals a day, snacks and water you have to either bring it or buy over there. You can organize tours to other islands from $3-$10 per person, just ask Franklin. The boat to and from the island is $10 each way. The island is generally one of the cleanest.There is some very good snorkelling in and around the shore. With plenty of Star fish, Sting rays and more…. Robinson’s: One of the original places in San Blas for backpackers, although the location is different to the old Robinsons as they moved to a larger island near the original. This island is larger than Franklins but still relatively small. 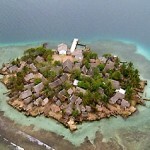 There are three to four groups of Cabanas and about six Kuna families living on the island. They charge $22.00 per person per night for dorms, or $55 for private cabins for two, including three meals a day, snacks and water you have to either bring it or buy over there, there is a tour to the local Community included in your stay, and others can be organised for a cost. The boat to and from the island is $10 each way. This island was, and still is, popular with backpackers but Robinson seems to have very bad phone reception so don’t be surprised if we have trouble trying to contact him. Ina’s:Ina is the Nephew of Robinson, although at times you wouldn’t think it….., it boasts the usual shacks with sand floors. It is located just up the beach from Robinsons. Some cabins are shared, some are private. They cost $26pp for dorms and $55 for private rooms for 2 people, including the usual three meals a day, snacks and water you have to either bring it or buy over there. Ina can arrange many tours to Islands like Dog or Estrella so just ask him and arrange a price when you are there. The boat to and from the island is $10 each way. This island is more built up than Franklins but is much bigger and has decent beaches. At the moment Ina is one of our top picks as the reviews coming back about the family and the food have been very positive, but things in San Blas are never consistent and this could change at any time. If you would like to see some more places, or those above the $100 a night (like Kuanidup pictured below) Please get in touch with PanamaTravelUnlimited.com. Please remember, this is not a tour. It is something we can arrange for you and each place is responsible for their own levels of service and comfort, we have no affiliations and just make the reservation for you based on feedback from our guests. Please let us know if anything they advertise is untrue and we will do our best to improve the service.